While on our way down to Hog Key, south of Everglades City, to do some snook and redfishing today we came across a this beautiful triple tail. He was hanging around a submerged tree, and couldn’t resist a riptide jig for bait. 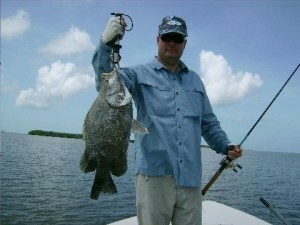 After we scored with this great fish, we continued down south, where we caught several nice redfish and snook. August fishing has been great, providing us with some non stop action! Don’t miss out! Give me a call, and let’s go fishing!